Orbs of alchemy upgrade items from Normal to Rare. Items are graded as normal, magic, rare and unique items. While rare item can have up to 6 modifiers, these items are more valuable. Furthermore, orb of alchemy can be used in various vendor recipes, purchase other currency or items, and crafting items at crafting bench in your hideout. (1) Farming orb of alchemy by slain monsters. When level your character to 2, you have a chance to acquire orb of alchemy. Kill Monsters of higher rarity will obtain a higher item level. Open more chests and strongboxes can acquire orbs of alchemy as well. (2) Vendoring unique items to alchemy orb shards, 20 shards will combine to 1 orb of alchemy orbs automatically. In order to sustain alchemy orbs, pick up every unique item while farming Poe currency. I have farmed hundreds of orbs of alchemy using this strategy. (4) “The Alchemist” is the prophecy of an orb of alchemy. (6) Buy orb of alchemy $0.66 / 200 with 3% off coupon “AOE”. One can farm hundreds of Orbs of Alchemy by using Alchemy Shards recipe, purchase from the vendor, Orb of Alchemy recipe, prophecy, and divination cards. Exchange PoE currency and items with other players can obtain lots of Orbs of Alchemy as well. Vendoring Unique items acquire Alchemy Orb Shards. 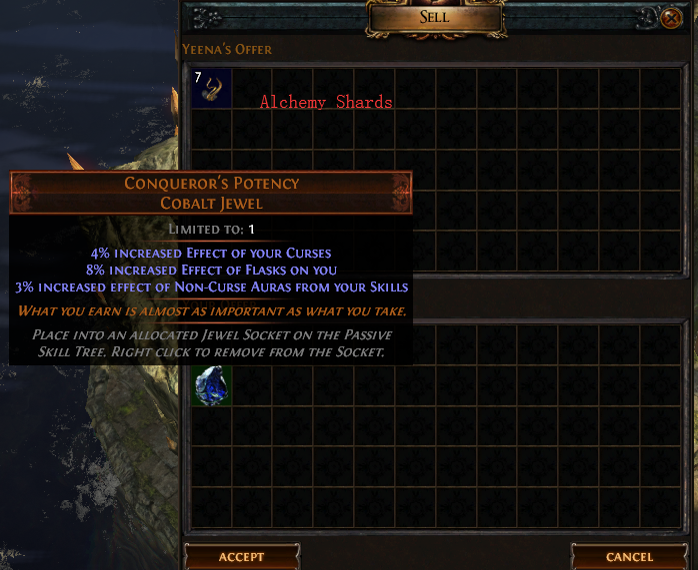 Alchemy Shard Recipe generally comes from items with corrupted and enchanted modifiers. More often, unique items have all had these mods and can vendor for alchemy shares with this recipe. 20 Alchemy shards combine to form an Orb of Alchemy automatically. Clarissa lives in The Sarn Encampment of Act 3, sell an Orb of Alchemy for an Orb of Regret. 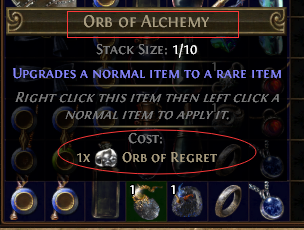 One can purchases alchemy directly if have lots of Orbs of Regret. These recipes are difficult and cost much time to collect items. I recommend using Alchemy Shards recipe, which picking up unique items for vendor orbs of alchemy. “The Alchemist” is a prophecy, which rewarding an Orb of Alchemy. Farm “The Alchemist” by killing any “Undying Alchemist”. One can find in these areas: Act 3 – The Sewers, Act 8 – Doedre’s Cesspool (The Toxic Conduits), Map – Cells, Map – Toxic Sewer, Map – Shore (rare), Map – Channel (rare), and Olmec’s Sanctum. A set of 3 “The Survivalist” can exchange 7 Orbs of Alchemy. One can obtain orb of alchemy by farming “The Survivalist” divination card in The Wetlands (Act 2). These orbs are both crucial to a player when leveling up one’s character. Orb of alchemy upgrades a normal item into a rare item, while Chaos Orb reforged a rare item with new random mods. Currently, the orb of alchemy to chaos ratio is 21:10. One can exchange 21 Orbs of Alchemy to 10 Chaos Orbs through http://currency.poe.trade/. Always, one can purchase 200 Orbs of Alchemy for $0.66 additional 3% discount with coupon “AOE”. 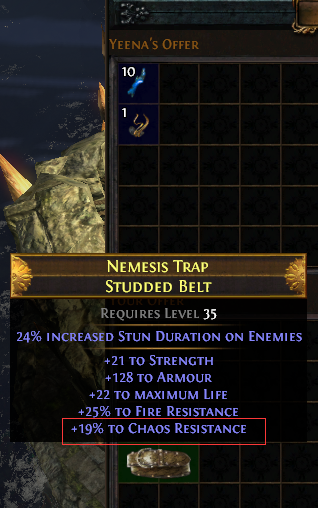 Orb of Chance upgrades item randomly. The item may become Magic, Rare, or even Unique. In fact, the most commonly will be resulting in a Magic item, uncommonly a Rare item. However, Orb of Alchemy upgrades normal item to Rare item with 100% guaranteed. Orb of Alchemy is more valuable. At present, 5 Orbs of Chance can exchange 2 Orbs of Alchemy. Many players sell low-tier maps for Orb of Alchemy and high-tier maps of Chaos Orb. Such as buy Pen Map for an orb of alchemy. Using Orb of Alchemy upgrade a normal map to a rare map. The map will have up to six affixes, one can take advantage of the large item quantity bonus. It is generally recommended to use Chisels + Alchemy on level 70+ maps. Upgrades a normal item to a rare item, including maps, strongboxes. Trade for other currency or items. Purchases maps, items or gems from a vendor. Orbs of Alchemy are also useful resources with a certain recipe at Crafting Bench.